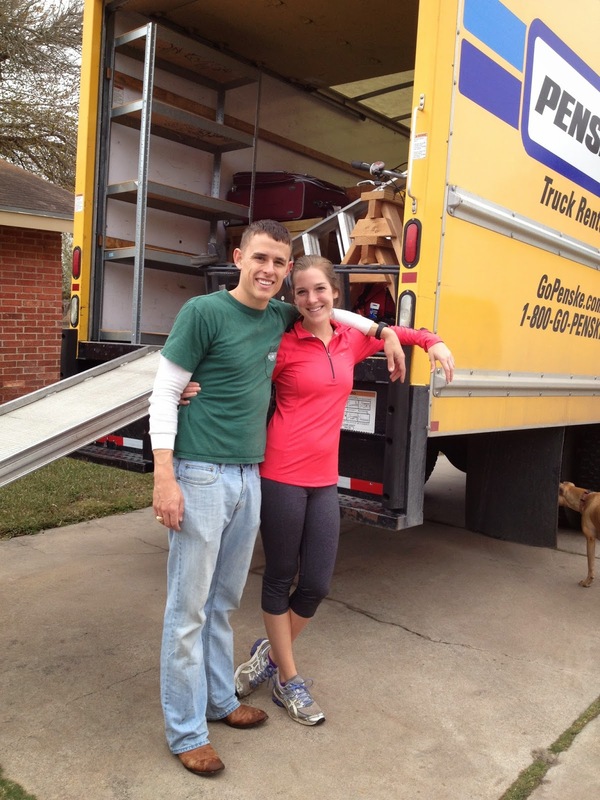 Let's call a spade a spade: moving can be a giant pain in the you know what. Parker and I have lived in 6 different cities in 5 years of marriage, so that's a lot of moving! Fortunately for us, moving doesn't cost us a cent when we are relocating on military orders. When Parker and I get the news that we are packing up and moving to a new city, we get really excited. The Navy packs us, loads up all our stuff, transports it, and unloads it in our new house. We are just responsible for getting ourselves to our new location, which is hardly anything worth complaining about. That's all well and good, but there have been 2 moves in the past 5 years that were not on military orders, so we were stuck trying to figure out how the rest of the world did it. Cue the complaining and whining about having to pack up our entire house and move it. We have been so spoiled by the Navy that moving ourselves seemed less than enticing. However, if we were going to be forced to move ourselves, we were going to do it the most cost-effective, practical way possible. 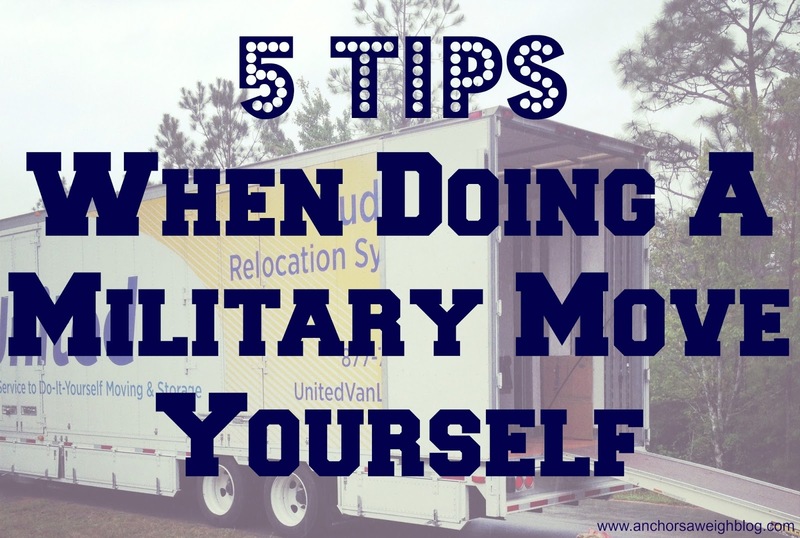 Specifically, there are 5 tips we like to keep in mind when doing a military move ourselves. 1. Renting a moving truck is like buying a car. It's negotiable. I found the very best deal online and then called the local truck rental company in town. I told them the deal I found, and they matched it. We knocked $100 off of our moving truck because of this. 2. Blankets and towels can double as bubble wrap. You have to move all of those blankets and towels anyway, so why not use them to wrap some of the more fragile kitchen items? 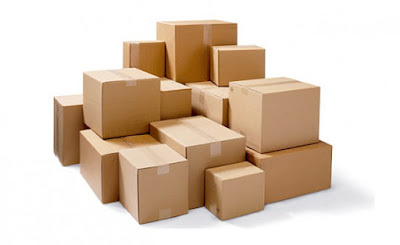 The trick to this is to pack the fragile items in smaller boxes, very compactly. I wrapped all of our drinking glasses in towels and packed them tightly together, and it kept them safe during the bumpy truck ride. 3. Boxes can be free. One of the most expensive parts of moving, if not the most expensive, is buying all the boxes. Those pieces of cardboard are not cheap! We could have easily spent several hundred dollars on new boxes, but we found a way around that. First, ask people who just moved for boxes. They are eager to get rid of them, so it's a win-win. If you don't know anyone who recently moved, then take a trip to your local Lowes and ask them for boxes. Huge shipments of merchandise come into these stores multiple times a week, and the boxes just get thrown away once the merchandise is unloaded. Parker went to Lowes one evening about an hour before they closed and came home with 20-30 boxes. The disadvantage of this route is that your boxes are all different sizes and harder to stack. The advantage? They are free. If you are moving far away and it's important to stack your boxes compactly, Lowes has the cheapest boxes to purchase as well. 4. Pay your friends with pizza to help you load/unload. Loading and unloading is a pain, and we honestly couldn't have done it by ourselves if we wanted to. I am just not strong enough to help Parker lift the heavy stuff, so we needed man power, literally. We had a few friends help us pack up the truck in the morning in exchange for free breakfast burritos, and we paid people to help us unload that same afternoon with pizza. Much cheaper than paying movers, and who doesn't love a little free pizza? 5. Look into furniture rental. This is something we recently discovered, but for moves where you may only be there temporarily or have to leave a lot in storage, it's a game changer! If you are in need of temporary furniture, CORT Furniture Rental has the perfect solution. Our journey in the military is unpredictable at best and requires a lot of flexibility, so CORT's easy solution to rent furniture allows each new house to feel like a home. It's essentially "furniture on demand" and is there when you need it and gone when you don't anymore. Simple. Hassle free. Worry free. I hope these tips are helpful to anyone with a move on the horizon. Moving can be stressful and a hassle, but these tips will help ease the process! All of our moves so far have been done by the military. Kyle and I always joke that one of us won't survive if we have to move ourselves haha. These are awesome tips though! We've never had the military move us... we always do a DITY! I love all of these points. :) We have never needed to rent furniture, but that's also a great option for longer TDYs for sure!! Andy wants to do the DITY route for the future. We'll see how it goes haha! I want to add advice on moving. I moved to LA recently. A reliable company https://www.moveprola.com/marina-del-rey-moving-company/ this is important for your transportation of things. This service will not take long. Moving to another place is considered a troublesome business, but only if you want to implement it on your own.